(Bloomberg) -- UBS Group AG’s two biggest legal cases in years are hitting the final stretch in a test of Chief Executive Officer Sergio Ermotti’s strategy of taking on French and U.S. authorities. Switzerland’s largest lender was hit with a long-expected fraud lawsuit by the U.S. that accused it of fueling the 2008 financial crisis by deceiving investors who bought tens of billions of dollars of risky mortgage-backed securities. The French state and prosecutors are asking for as much as 5.3 billion euros ($6 billion) in fines and damages over allegations it helped clients hide money from authorities. UBS’s hard bargaining has resulted in both cases going to court, often a last resort for banks, with the worst-case scenario being huge fines and lengthy legal battles. The cases are among a series of such obstacles Zurich-based UBS has faced since the start of the financial crisis a decade ago, including a $1.5 billion fine in 2012 for rigging the Libor benchmark. Tax-related investigations have also cut into the bank’s reserves: it paid $780 million in the U.S. nearly a decade ago and about 300 million euros in Germany in 2014. UBS declined as much as 3.1 percent in Zurich and was trading 2.9 percent lower at 14.08 francs as of 9:17 a.m. local time. "The French are demanding a lot -- probably ten times more than what I estimate UBS has provisioned,” Daniel Regli, an analyst at MainFirst in Zurich said by phone. “At a maximum, half of that amount would be realistic. The Swiss bank "has gone the route of fighting cases, most have come to agreements with authorities. Time will tell if this more aggressive approach works out." It’s an approach that worked for British bank Barclays Plc. It fought back against the DOJ in a similar case two years ago, when negotiations broke down over the size of the penalty involved. 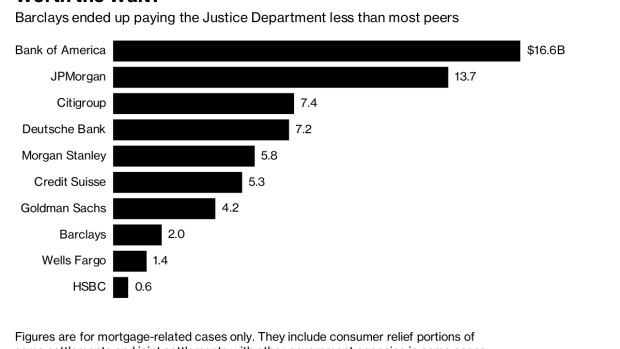 Federal prosecutors in Brooklyn filed a civil complaint against the bank, but ultimately settled the case earlier this year for $2 billion, less than half of what U.S. authorities had originally demanded. The UBS case in France ended up in court after settlement talks between the bank and authorities broke down in March 2017 over the size of the fine. UBS had been pushing to settle the French investigation for less than the 300 million euros it paid to resolve a similar case in Germany. Prosecutors in France asked the court to impose a record fine of 3.7 billion euros that would be commensurate with UBS’s size, the nature of the crime and the damage to society. The French state, which is a plaintiff in the Paris trial, is seeking 1.6 billion euros from the bank in addition to any court-imposed penalties. “The underlying facts are of an exceptional breadth and a systematic nature,” Prosecutor Serge Roques said Thursday during his closing arguments at the month-old trial. Before the court case started, UBS had to post 1.1 billion euros in bail. The bank had denied all the allegations. Roques went through a complicated explanation to argue that the the fine should be based on 2015 evidence from French investigators that found almost 4,000 French residents with Swiss UBS accounts made late tax payments on assets worth about 3.8 billion euros.